Presenting at 5 and 6 PM, The Preservation Brass Band with Kevin Louis. 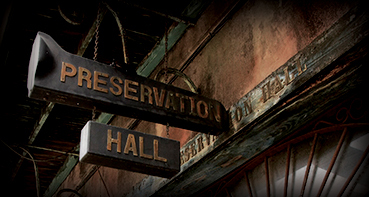 Presenting at 8, 9, and 10 PM, The Preservation All Stars with Rickie Monie. Monie came to know Milton Batiste, Manny Sayles, Harold “Duke” Dejan, and Sweet Emma Barrett as he went to hear music in the French Quarter. In 1982 he began sitting in for the aging Barrett. “The time I spent sitting next to Sweet Emma was like going back to school,” he remembers. “Words can’t always communicate a musical idea or concept. Sometimes, you just have to be there and experience it for yourself.” The Dillard University graduate has performed with Dave Bartholomew, Clarence “Frogman” Henry, Dr. Michael White, Gregg Stafford, and Topsy Chapman. Monie is also an accomplished clarinetist and regularly plays the organ in churches around New Orleans.